Way back on December 10, 2011...prior to the exploding popularity growth of Graveyard Carz, we had the opportunity to meet Mark, Daren, Josh and Royal. 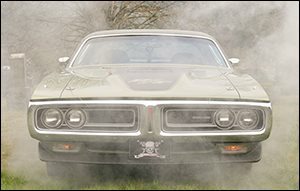 Mark and the crew had just finished their work on a 1971 Charger R/T 440 Six Pack and was in need of a show sign. 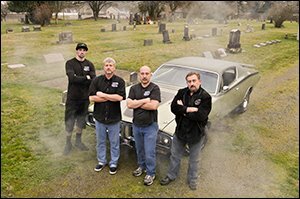 After a tour of the shop, and the necessary photos of the car were taken, we grabbed a fog machine and headed to a local cemetary to take some random shots of the car and crew. As it turns out, the owner of the Charger decided to sell the car and he ended up not ordering the show sign, but I'll forever treasure these pictures of our "Day at Graveyard Carz". Mark and the guys were a delight to be around and it's clear why their show has become such a hit! Thanks Mark, Daren, Josh and Royal and congratulations on your success! 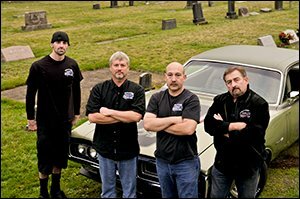 Graveyard Carz is a reality television series that currently airs on Velocity. 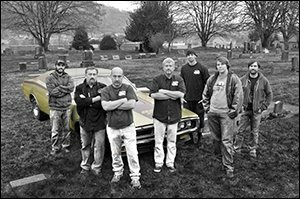 The show documents the select crew at Mark Worman's collision shop, Welby's Car Care, and their restoration, research and documentation of Chrysler vehicles. The restoration footage is bookended by Worman's musings and commentary, usually at his workers' expense. The crew also provides commentary on the projects, as well as about working with each other. Occasionally the owners of cars being restored visit the shop and tell their story. It is made on location at Worman's collision shop in Springfield, Oregon.